Retailers in the U.K. claim that Electronic Arts will force a shooter showdown with Activision by releasing Battlefield 3 as close as possible to Modern Warfare 3. It's no secret that EA is tired of playing a distant second fiddle to Activision in the combat shooter arena. It took a shot at the title with last year's Medal of Honor, which managed respectable sales but didn't even come close to the numbers put up by Call of Duty: Black Ops, but now it's ready to really drop the hammer with Battlefield 3. In April, Electronic Arts CEO John Riccitiello said he wanted a "battle of the titans" between BF3 and MW3 and while his comments had a certain ring of bravado to them, it's starting to look like he wasn't kidding around. Battlefield 3 doesn't have a release date and Modern Warfare 3 hasn't even been announced yet but retailers in the U.K. told MCV that EA plans to launch its shooter right on top of Activision's. 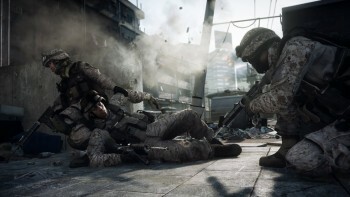 The site speculates that Battlefield 3 is more likely to come out a few days ahead of Modern Warfare 3, but a same-day release is also a possibility. "EA hasn't been shy with Battlefield 3. It's well known it will tackle CoD head-on," one source said. "We're ready for them to arrive within days of each other." Buyers for retailers told the site that the next Modern Warfare is expected to have a release target of the second week of November, a date that will be officially confirmed by May 23. Regardless of when Battlefield 3 arrives, EA has said that it will be its biggest launch ever, with an "enormous commitment of resources" put into promoting it. It looks to me like the 2011 holiday just got a whole lot more interesting.